San Juan metro area, I am willing to travel anywhere in Puerto Rico and nearby Islands. I work on a reward basis that is agreed upon in advance. That means you pay what you feel item is worth for me to come out and search for it and reward must be agreed upon prior to arrival. If lost item is not recovered, you only pay trip fee. A minimum trip fee of $40 is charged to cover cost of fuel. This fee is charged even if the lost item is not recovered. Beaches, Parks, yards, mountains and streams, swimming holes. Can search in the water. I enjoy finding lost items. Reuniting people with their lost items is a pleasure. 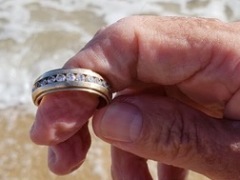 July 11, 2017, gold wedding band lost in the surf. About 2 hour later I returned the ring to the happy couple. My husband and I went to Puerto Rico to take a break from school and visit/spend the holidays with our families back home. We went to the beach in January and decided to take our fur-baby with us for his first swim at the beach. When we went into the water, I was holding my dog and as soon as I was getting ready to release him so that he swam, I felt his nail pushing my wedding rings off my finger! Everything happened so fast. My husband and I tried retrieving it by trying to touch everything we could with our feet (my husband even cut himself), but the waves were not making it easy. After a few tears, we gave up and went home. 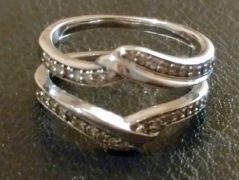 That night I googled what to do if you lose a ring at the beach and found an article with recommendations and almost at the end “ring finders” was mentioned. I had never heard of this website, so I looked it up and found Donald! With little hope I called him the next morning and explained what happened. 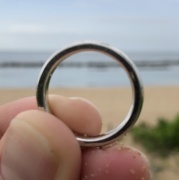 Donald was able to go to the beach where everything happened that same day AND he found one of the wedding rings! So, suddenly my hope was/is back! I am hopeful that he might find the other one. THANK YOU Donald! August 24,2018 I lost my ring in the ocean in San Juan while swimming. 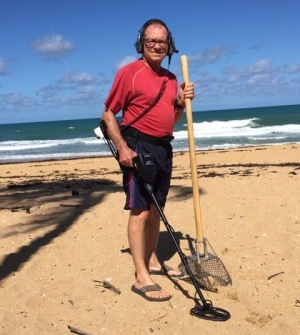 I contacted theringfinders.com and was pointed to an awesome gentleman who happened to be in the area (lucky me). He came out with his partner first thing next morning and the hunt was on. About an hour later they asked me what my ring looked like and BOOM my ring was in his hand!!! Thank you so much. Words can't explain how happy and grateful I am! Celebrating our marriage at our beach house in Puerto Rico, my wife and I decided to swim in the ocean. After a few minutes of enjoying the sea, I felt my heart drop. My wedding ring fell off my finger. I could see in my newlywed wife's eyes, what she was thinking and it was not good, "You lost the symbol of our marriage within a week." While she stayed in the place I thought I lost it, I ran to the house to find goggles. After a day of swimming in the ocean and looking for it, I thought it was gone. The next day, I got up an swam for it for another 2.5 hours. I had already looked for it for over 8 hours in the ocean, and was about to give up. I randomly, googled "how do you find a ring in the ocean?" and came across Donald O'Reilly of theringfinders.com. Don and I spoke, and he was at my home within a few hours. 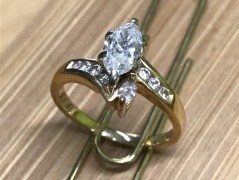 He was polite, timely, had a great attention to detail and was an excellent listener to my story and the possibility of the location of the ring. We both got in the ocean and began to search... after about 20 minutes, I said to Donald, "This feels right... this is about the location". Within 2 minutes of saying that Donald detected the ring! Donald, thank you so much for everything you did. You're a life saver. What you did was priceless. short I will tell you how I met my angel. you did and I have faith that you will find the other ring.